After cashing in on the Montauk Monster hysteria for ten days, the makers of a low budget movie are now singing a rather different tune. The crew of the new Lea Thompson film Splinterheads were shooting in Montauk when the monster sightings first occurred and have been linking to a Gotham News report on their website ever since and even brazenly displaying a picture of the famed beastie. Now though, the film’s writer-director Brant Sersen has decided to own up to the fact his movie has nothing to do with the monster at all. Not only that but he is trying to pin all the blame on a 16-year-old kid who allegedly set up his own fake Splinterheads website to make a bit of money for himself. Explains Sersen on his website Sersen Park: “It’s amazing what a quick thinking 16 year old entrepreneur can do. Here’s what happened – Newsday does an article about our film (which is shooting near Montauk). 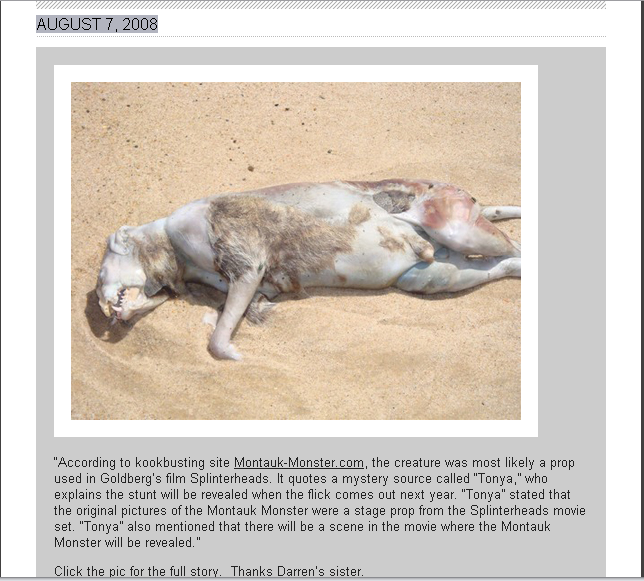 Montauk Monster story breaks, kid steals some of our graphics, sets up a fake official Splinterheads website, makes up some names and voila – a national story. It’s not that we don’t believe you, Mr. Splinterhead. It’s just that we don’t believe you have the gall to blame a kid for being a kid, when you have milked this story for all it is worth. Rather hypocritical. Pictures of the monster have been on your site for 10 days now, generating thousands of hits and interest in a movie which would otherwise be ignored. You finally admit Goldberg doesn’t have a sister called Rachel and yet on your August 7 website entry, you posted: “Thank’s Darren’s sister.” Funny but misleading. Instead of blathering on about 16-year-old ‘entrepreneurs,’ try to look on the bright side. No one will watch your flick when it comes out next year but lots of people have read your website because of the monster! The real mystery is why a beautiful and talented actress like Lea Thompson would want to be associated with the film! This is how Splinterheads tried to cash in on the monster on their website on August 7. Some people have no shame! The people who spiced up our summer with the Montauk Monster are now apparently trying to cash in by selling their websites on eBay. As we revealed last week, the whole beastie story was probably just a silly marketing trick to promote interest in next year’s B-movie comedy Spinterheads, produced by Darren Goldberg. Now it seems hoaxers have put three uninspiring and unofficial Splinterheads websites up for sale. So far though, they haven’t had much luck with bids ‘shooting up’ from 99 cents yesterday to $1.04 today. As we feel a bit bad for them, we might dig into the Gotham News purse and get it up to $2. Or maybe not. Part of the problem, monster fans say, is that the Splinterheads movie appears to have nothing to do with monsters – it’s about carnies instead. It is now safe to go back into the Montauk water but fascination with the mythical monster is still at an all time high. Scores of web publications picked up our story about the monstrous hoax yesterday, thus guaranteeing Splinterheads producer Darren Goldberg his 15 minutes of fame and sending our own hits through the roof. Despite Goldberg’s shenanigans, some locals are still convinced though that there is something out there – a Montauk version of the Loch Ness Monster. If you get any real monster sightings send them in to us at newsdesk@gothamnews.co.uk. The so-called Monster of Montauk has been exposed as an imaginative publicity stunt dreamed up by the makers of a new movie. Apparently, Rachel Goldberg, the woman who discovered the famed beastie, is the sister of none other than producer Darren Goldberg (pictured above), who is making a movie about, you guessed it, …monsters. Rather than being a scary sea monster, the creature was in fact just a cheap prop used in Goldberg’s film Splinterheads. You can read all about the making of the movie here. 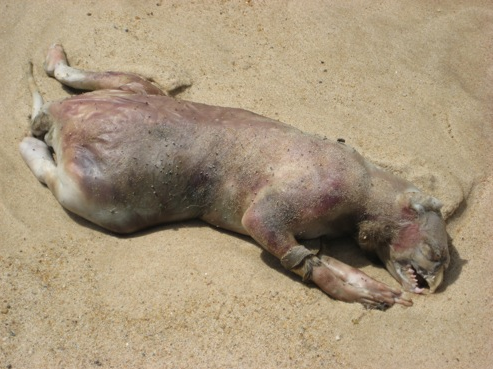 Meanwhile, with the ‘riddle’ solved, Nicky Papers, the owner of Montauk-Monster.com – a site set up to investigate the sightings – has now put his domain name up for sale. Somehow we doubt he’ll be getting monster-sized offers for it! Explains Papers: “Maintaining this website has become too much work for me and it’s been hard finding time because I have a full-time job. Additionally, I need to spend more time with family.” Yeah, right – that’s the reason! Welcome to the web's newest source for all things Gotham. We're the curio-blog Batman would read ...if he could. Enjoy our quirky news feed, as it casts its weary eye over America, and help us in our bid to make Gotham City the official nickname for New York. Should Gotham City become New York's official nickname?